Since Fall is literally knocking at our doors it is time for me to find a better way of organizing our entry area into the house. See - summer isn't too bad. Mostly all we bring in to the house are sandals and the mail. But throw a couple of coats, umbrellas, gloves, boots ... well you get the picture. We just end up with more stuff in the winter and if it is not properly contained at the entry - it ends up all over my dining room table. So here are some great spaces to get you inspired. Now my mind goes straight to built ins when thinking about organized entries. This is a great one. The built in bench has drawers! Love it. Be still my heart - I love this bench! The paint, the moulding ... everything is perfect. Simple, efficient, and clean. Ah - don't you feel organized just looking at this. Love this one - it has just about everything in my check list! The chalkboard is a perfect addition! This one just goes to show that you can keep your style and still be organized. 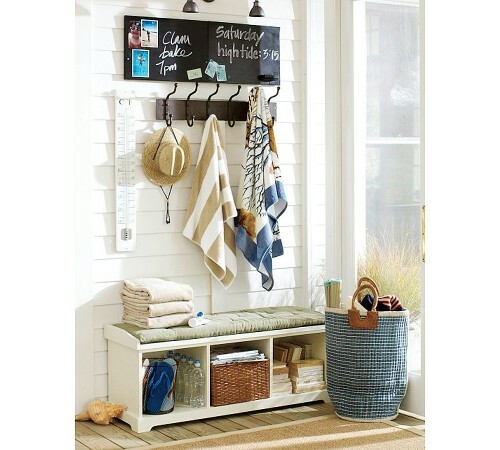 I adore the shabby chic look of this entryway. It isn't modern or contemporary at all but your still organized! 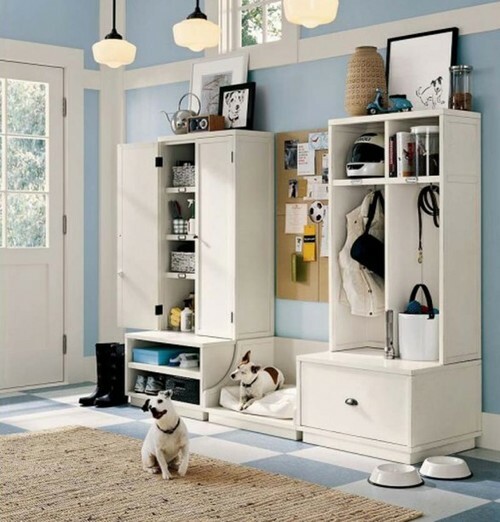 Even if you don't have a whole lot of space, you can still create organizational areas. Think about grabbing a single cabinet that you could wall mount like this from Restore or Craig's List. Love it! Love the lockers and the corkboard here! Totally from a magazine but full of great ideas! So what about you? What are your must haves for an entry? Do you have a place for all your coats and such in your house? Or do things end up just draped over chairs and tossed on tables? I wanna know I am not the only one living in that disarray! Linking this to the Creative Organization Party with Melissa @ The Inspired Room. Hop over for more great organizing tips! Those are all great pictures and so inspiring! I have a thing with lockers - I love them! 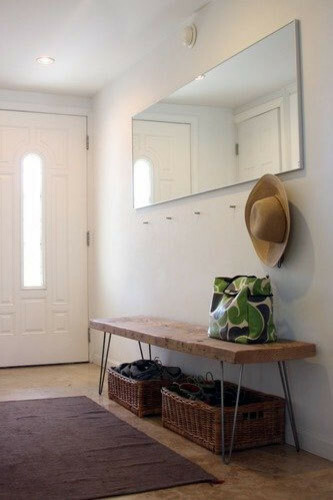 it is really hard for me to keep my entryway space neat and tidy. Thanks for the tips!! This is a constant struggle in our house. With 3 kids who all are in school and all play sports the amount of stuf that is dumped at the front door is crazy. I am always struggling to find that perfect compromise of ease, looking good, and organization. I absolutely love the third one. The bench is beautiful and the design is sleek with a bit of softness / tempered ruggedness. The one by J.Weiss is just too perfect, you what I mean? I feel like there isn't a lot of personality in it. My entry way is a bit of a problem right now... because it's narrow (4'across). It's about 7 feet to the closet doors and three feet in the closet. At the moment we have an industrial clothes rail for coats - but we're thinking of building a porch area onto our house to have more space for things like this. I absolutely adore the last one. 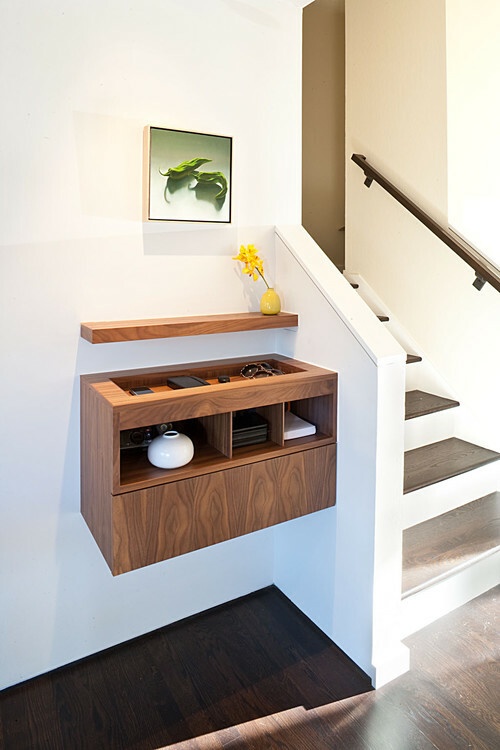 LOVING these entryway photo's! Thank you for sharing! I am trying to decide how to design our little new entry. Thanks so much for all the ideas and inspiration. My entry way needs some serious help, although it is small. I am loving your blog..hope you'll come visit me over at Free 2 Be Frugal sometime.